Every time I read an article about applying foundation, using a brush is one of the preferred techniques, still most of us use our fingers I guess, so do I.. which of course has not stopped me from trying this brush. I got this foundation and concealer brush some weeks ago while shopping online out of the different types of makeup brushes available there. So, I will share some good points and not so good points about this liquid foundation brush today. 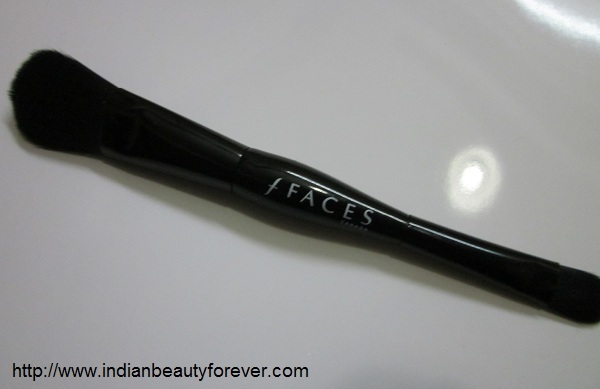 My Views- This Faces Canada brush comes with two brushes at the opposite ends. One is a foundation brush and on the other end there is a concealer brush. The brushes have the same type of bristles and the material. In general the bristles are quiet soft and dense for both of them. If you have seen the brush that comes with the Maybelline color Tattoo, these brushes have got the same metal base in black and similar type of bristles. In fact the concealer one is same as that of the Maybelline one in size too. Let’s talk about the Liquid Foundation brush first. It is less than an inch in width and more than an inch in length. The bristles are fine and smooth that tapers at the top so as to make the blending easy and it can go in the fine lines too. 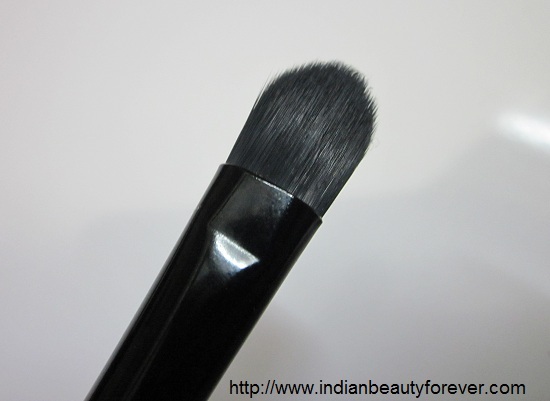 Bristles pick up the product very well and applying your base makeup becomes a lot easier with this brush. You can still not completely rely o this since I did notice some streaks so that means we may need to blend in with your fingers probably around the contours of your nose though elsewhere it proved to be doing decent job. so, these days I am liking to apply my foundation with this brush. I am not a fan of cakey face or over concealing even if my marks are not covered completely though it can build the coverage further. Have you realized that when we apply your make up base with a brush then the bristles can actually force the product into the fine lines making them less visible, thereby skin appears smoother. Same goes for pores!! 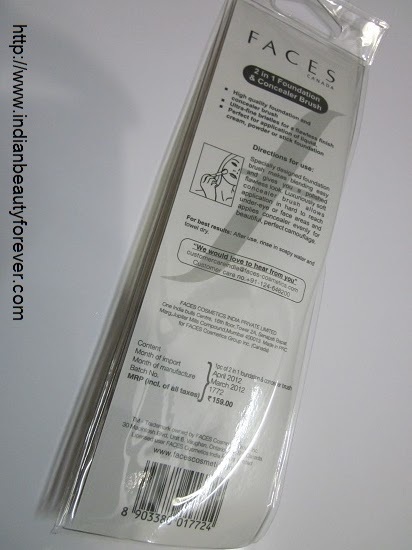 I have used it and washed twice and the bristles have not shed so far. It is really important to wash your brushes since they can easily transmit the bacteria left on them from the old makeup residue. The concealer brush is same as the foundation brushbut a little smaller in size with bristles tapers when you go upwards.the bristles are gentle for the delicate eye area. but not softer than the Eco tools that I ma using these days. Handle of the brush has enough room so as to grab it properly while you work with it or may be it is good for my small hands :D.
I had their smokey eyeshadow palette and the brushes that came along with that I do not like them at all but this one is really good. 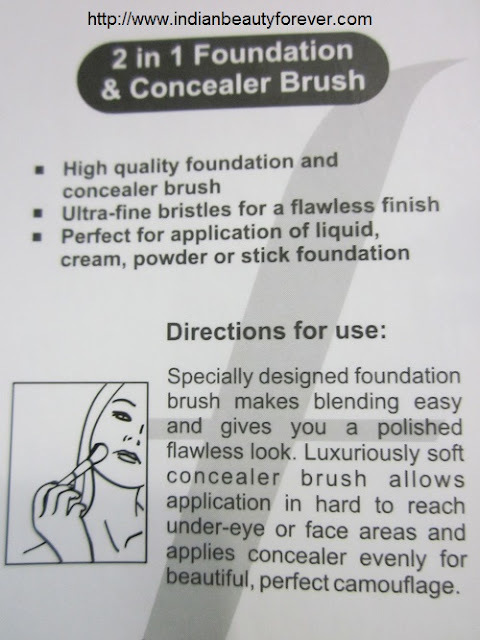 Overall, if you are a beginner and would like to use brushes then go for this foundation and concealer brush. I am a beginner too well may be a little more than that by now.:D. Easily available online and budget friendly makeup brushes. Bristles are quiet smooth and nice. Bristles tapers upwards so as to get the get the product in the crevices nicely. Bristles pick up the foundation very well. 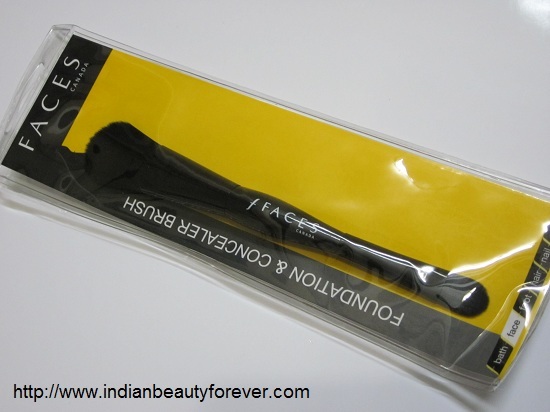 Concealer brush is of good size that it can does a good job. Blending with your fingers can be required sometimes for certain areas or else can look streaky sometimes. I could not see any other cons in this product considering its price. 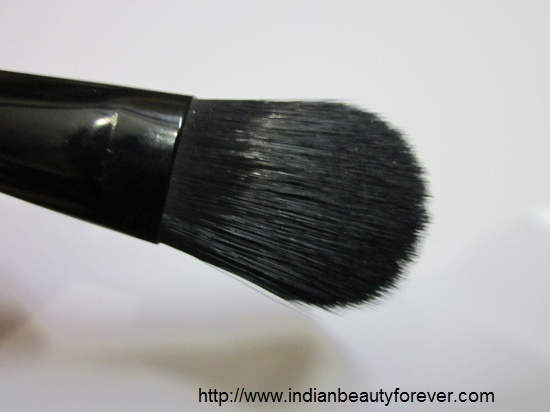 My take- If you are looking for an affordable foundation brush then go for it. It is a good product for the price and also comes with a concealer brush like an add on. Blending with your hands will be required as a last step though. Looks like a great foundation/concealer brush for convenience and like you said for its price the brush looks be do doing the job as needed. I've never use brushes for doing my foundation but on special occasions I do use a concealer brush like that and a buffing type brush otherwise unless the hair is very rough most brushes are perfectly fine! Thats right Sharlynn, it is indeed a good brush for the price. It is my first one too since earlier i used to put foundation with my fingers. But that will be required at the end with this as well. Nice brush :) this brand I hear for the first time. Do you have more products from this company? I' m getting this :) Thanx for the review! I have the set from Vega, they are average but the individual ones are good i have heard.